Do you have the right credit card? Can you get a lower rate? Introductory credit cards rates and balance transfer offers can allow you to save on interest charges if you have a balance on a credit card. But what happens after an introductory period or transfer offer ends and reverts back to the normal interest rate? If you regularly carry a balance, it's important to get the lowest interest rate on regular purchases as possible. Does the promotional interest rate last long enough for you to pay off the balance in full? Which card has the lowest interest rate on regular purchases? What is the default rate on both cards if you are late with a payment? Default rates can soar above 30%. Do you plan to use the credit card for cash advances, which usually have higher interest rates than regular purchases? Do you need credit card rewards? About 82% of credit card offers back in the first quarter of 2010 offered rewards, according to Synovate's Mail Tracking Service. Rewards programs can give you cash back, free air miles, hotel stays, and other perks. But should you sign up for a rewards program or stick with a non-rewards card? Consider these things before signing up for a new rewards card. Do you currently have rewards points that have never been claimed? Don't close your current credit card without using your points. 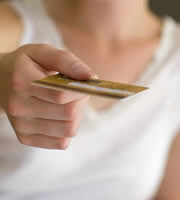 Are you willing to pay a higher interest rate to participate in a credit card rewards program? Rewards cards usually have higher interest than non-rewards credit cards. Does the rewards program offer cash back? You may be better off getting a credit applied to your outstanding balance than using points to buy gadgets and other merchandise you don't really want. Once you begin gathering offers from several credit card companies, you may find that you haven't been getting the best deal with your current card. Before canceling your account, call your credit card issuer to see if it will match or beat other offers you are considering. If not, don't hesitate to take your business elsewhere. 0 Responses to "Do you have the right credit card?"